There hardly must be any avid traveller or a person in the world who is still unaware of the splendour and beauty of the Pink City of India, Jaipur. Well, if you are one of those unaware beings, then your trip to Jaipur mustn’t be put to an end without having tried the city’s specialities, as well as, some experiences that are totally unique to Jaipur. For others, who have heard a lot about this city but are confused of the plethora of options available here, then we suggest you to try the most sought after things in the city. You can take a direct Delhi to Jaipur, or Jodhpur to Jaipur train, as per your need, and as and when you reach your destination, the merriment starts right there. Read ahead to know about the best experiences and things to do in Jaipur. 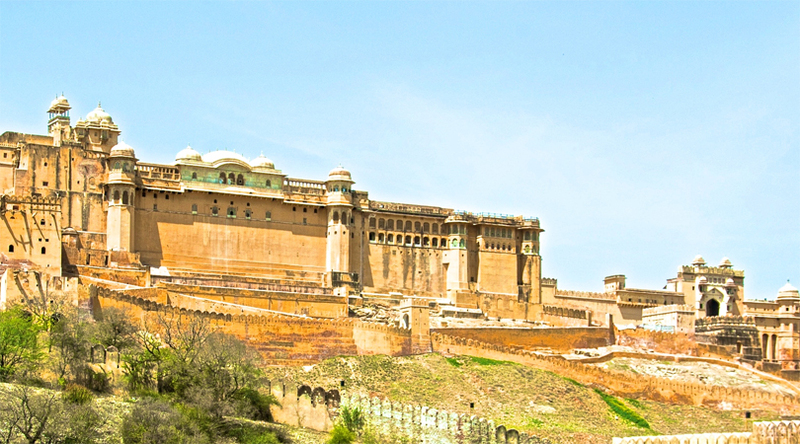 The Amer Fort and Palace, better known as the Amber Fort and Palace is situated on a steep slope in Amer around 11 kilometers from Jaipur. The fortress, was built in the sixteenth century by Raja Maan Singh I, and is made of red sandstone and marble. The legacy structure talks about the excessive ways of life and transcendence days of the Rajput rulers. While you are there, take an elephant ride around the bulwarks and stand on the most elevated balcony to get a good look of the rough terrain around the fortification. From a bird’s eye view, the entire pink city of Jaipur looks like shimmering pink gems. Who wouldn’t want to admire this stunning view, and that too from such an altitude, right? For this very purpose, and for such enthusiasts the Hot Air Balloon Safari is a must-do thing while in Jaipur. You’ll be served with fresh and hot cookies along with tea/coffee at the launch site, and sometimes these balloons land in the villages, stealing all the limelight. So along with the hot air balloon ride, you also get to spend some time admiring the village life and if desired, talk to the locals as well. How delightful does that sound, no? If you wish to see how the classy and the royal class enjoy their sports, then you must visit the Rambagh Polo Ground, where usually Polo tournaments take place. If not a match, then there is an exhibition match or a practice session going on in these grounds. Avoid visiting in the extreme summer months, for the sweltering heat of Rajasthan could actually roast you in and out, whole. One of the busiest markets in Jaipur, the Bapu Bazaar draws in travellers by the crowds. It is a fortune trove of salwar suits, bedsheets and juttis in styles ranging from Sanganeri prints, bagru prints, batik prints and bandhej. Discover one of a kind, ethnic imitation jewellery, customary handiworks, fragrances and knickknacks in the by-lanes of this market that will serve as sweet symbols of your spectacular trip to Jaipur for a long time to come! 5. Kachoris and Jalebis, anyone? Your trip to Jaipur is worthless if you come back without trying the drool worthy Kachoris and Jalebis at Rawat’s for breakfast! Arrive before the actual time to beat the lines and devour the trademark dishes while viewing the city spring up. Situated between the Railway Station and the Bus Station, this minimal sweet shop will make for an awesome pre-shopping or city-exploring pit stop. With a myriad of colors and aspects springing up after almost every kilometre, the city of Jaipur will fill you to the brim with intriguing experiences that, even if you travel the whole world, you’ll never get enough of. So pack your bags, and set out to the city of colors, joy and cultures– Jaipur.